We fit Jewish education into the day-to-day busy lives of urban families. We pick children up Monday through Friday from area elementary schools, on a flexible schedule. They walk back to our center at 20th & Sansom Street for a healthy snack and a whole afternoon of Jewish learning, until parent pickup by 6pm. While they are with us, children also have time with friends and mentors and begin homework, too. Child-led learning: Children pursue their own interests and learn in ways that work well for them. Relationship-building: Emotional intelligence and community building skills are core concepts. Playful, Joyful Jewish learning: We have FUN exploring Jewish text and ideas and making them relevant. Parent Empowerment: All parents are empowered interpreters of Jewish tradition, especially at our weekly Family Shabbat Celebration. We begin the day gathered for snack and to choose Shulchanot Avodah (project centers) at Makom Community. Then we jump right into our learning. While students are eating, we study a section of text. We start with an opening activity to anchor the students in the main ideas of the text and then have a conversation delving into the messages of the text and how we can apply them to our lives. One child busily records himself on an iPad re-telling a story from Exodus that we studied together the week before. Two other students are using natural materials to build representations of scenes from a text story. Another student flips from image to image online as she tries to imagine what the flora and fauna might have looked like in an earlier time. Another student is interviewing visiting seniors about their experiences with people of different faiths when they grew up in Center City. One student sits quietly on her own writing in her journal. Teachers move from student to student finding out whether he or she can help with the project that particular student is working on. Everyone moves over to a carpet as we sing a niggun (a wordless tune). We sing prayers and move with the music—jumping, walking, and contextualizing the text of prayers through the use of gestures and sign language to provide deeper understanding. Many of the students volunteer to lead parts of the prayer service, but some do not. 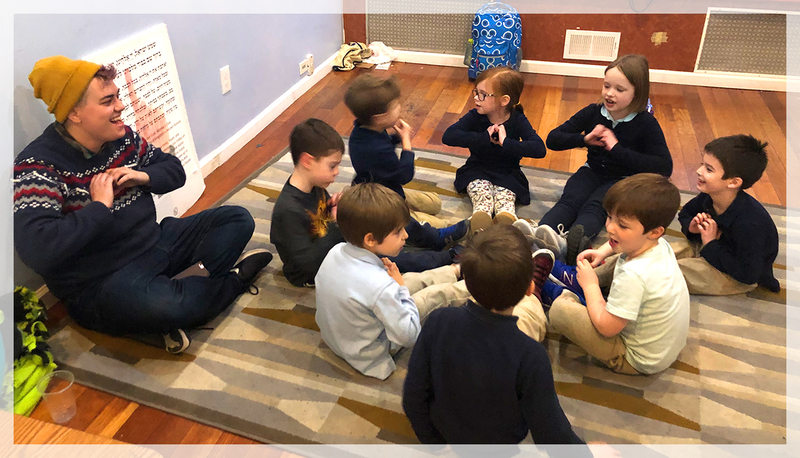 Some students choose to lead pieces, and others pull out their notebooks to write down or draw ideas that come to them during Tefilah: Prayer, Music, and Movement.